Are you looking for a reasonably-priced 12V or 24V electric cooler? The most common type is the thermo electric cooler. These don’t cool your drinks as much as a refrigerator, but they are lightweight, simple and large enough to cool several dozen cans plus snacks. Thermo electric coolers are also inexpensive. Then there is the portable mini-fridge / freezer, which uses a electric motor-driven compressor just like your kitchen fridge. These cool much better and can even freeze food and drinks. But they are heavier, more expensive and maintain their cool for less time than thermo-electric coolers. In this buying guide, we recommend top-quality portable coolers (thermo electric and compressor-cooled) for a number of common situations including the beach, boat, camping and your car or truck. After walking through the best portable coolers, we walk you through the features to look for when shopping for an electric cooler. So to begin, let's take a look at the best portable electric coolers selling today, listed in the table below. Note: If you are looking for a 115V or 220V outlet-powered portable air conditioner for your RV, boat or home, then see our portable AC buying guide. 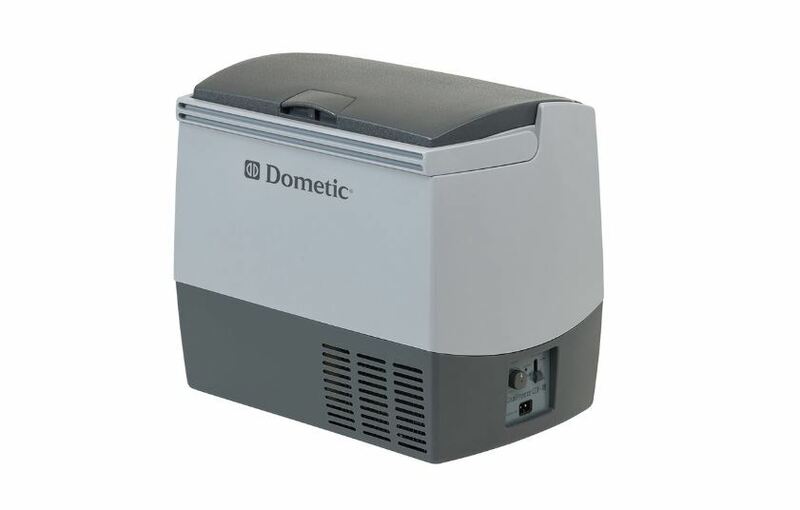 The Dometic CF-018DC portable cooler is a miniature version of the fridge in your kitchen complete with the compressor and coils. It’s essentially a portable refrigerator/freezer. The increased cooling capability compared to thermoelectric coolers is handy if you travel or go camping a lot and need to keep your food and drinks really cold or completely frozen. And because the cooling is not dependent on the temperature of the environment – unlike thermoelectric cooling – you can use it anywhere as long as you have a power source. The 19-quart capacity is a bit small but can fit up to 23 x 12 oz. cans. It has a convenient compact design that won’t take up much space in your car. Verified owners say it runs quietly most of the time. You’ll hear some noise when the compressor comes on occasionally. • Compact design, ideal for traveling. • Freezing function – not available in most iceless coolers. • Lower capacity than many other electric coolers. Igloo is often the go-to brand when you need a good quality and reliable cooler, ice or iceless. 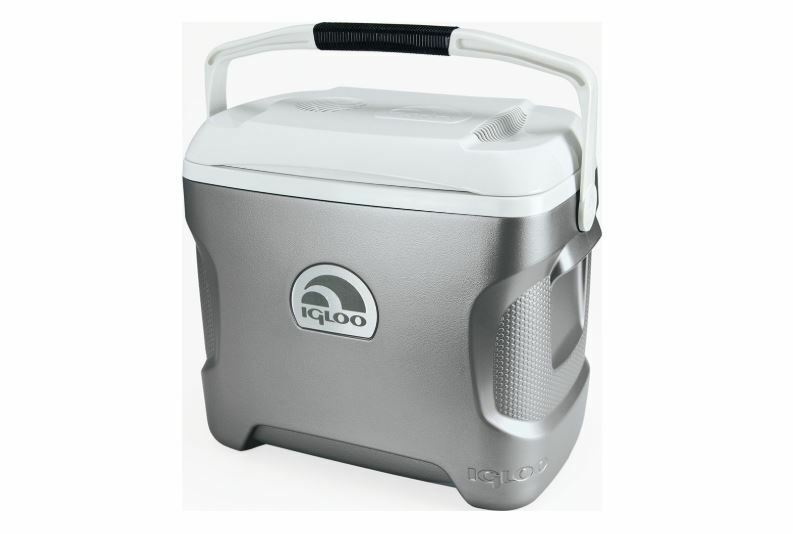 When it comes to the iceless Igloos, the Igloo Iceless 26-quart thermoelectric cooler is their best. It uses thermoelectric cooling which gives it the advantage of more space for your cans and a lightweight design for easy portability. An ergonomic handle makes it easier to move it around. They have also designed the back to comfortable hug your side as you carry it. You’ll find it easy to carry even when it’s full. The Igloo Iceless comes with an extra-long 8 ft cord that you can plug into any 12V DC outlet like your car’s cigarette lighter. If you want to use it at home with an ordinary power outlet, you’ll have to buy a 110V adaptor, sold separately. The Igloo Iceless can cool drinks up to 36 F below the outside temperature. But unlike an insulated compressor-run cooler, it will warm quickly when you disconnect power. Additionally, it will not keep your drinks as ice-cold as your kitchen refrigerator. But they will be cool enough for a hot day. • The fan makes a bit of noise. If you want a bigger refrigerator that is easy to travel with, the Coleman PowerChill Thermoelectric cooler is a great choice. At 40 quarts it’s quite large. It can fit up to 44 cans. There is an adjustable storage tray inside to help you keep your food and drinks organized. You can also change the door’s opening orientation depending on the situation. Despite the large capacity the Coleman PowerChill is light at just 18 lbs. The lightweight design combined with the ergonomic molded handle make it really portable. 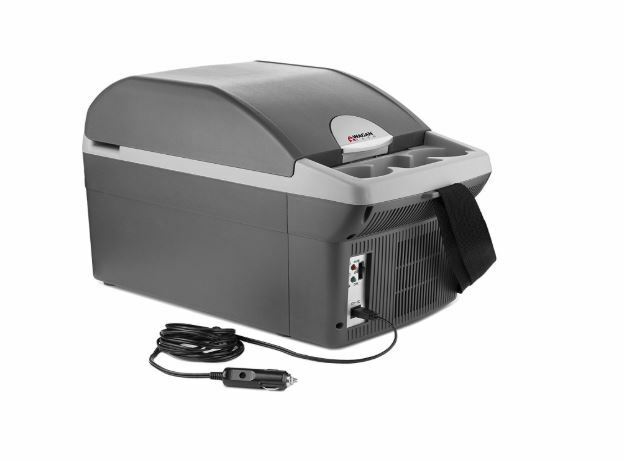 The PowerChill comes with an 8-foot cable that plugs into your car’s or boat’s 12V outlet. So you can also use it in an RV, dorm room or even in your backyard during grilling season. This Coleman also comes with an adapter that you can plug into your home’s 110V/120V outlet. With many other coolers, you have to buy the adapter separately. The redesigned motor is extra-quiet and powerful enough to cool down your drinks to 40F below the surrounding temperature. You can use the Coleman PowerChill cooler while it’s upright like a small fridge or lay it down on its side – whatever works for your particular situation. • Higher cooling capacity compared to most thermoelectric coolers. • Includes adapter for home use. • Some complaints about durability beyond 2 years. This cooler is smaller than most thermoelectric coolers. But that’s what makes it perfect for the car. You can stuff it in the boot or between the seats at the back. Unlike most thermoelectric coolers that just cool, this Koolatron cools and warms. It can cool your drinks up to 40F below the surrounding temperature and warm them to around 135F. So whether it’s a chilly morning when you need a warm drink or a hot afternoon when you need something colder, this cooler is perfect for all kinds of situations. The Koolatron P-20 portable cooler comes with a 12V plug, but you can buy an adapter separately to use it at home with your 120V outlet. There is a handle for easy portability. It folds down out of the way when not in use. The P-20's motor is quiet, powering a fan that circulates the air evenly throughout the cooler for even heating or cooling. • Made in the US – more reliable and lasts longer. • Versatile - provides both warming and cooling functions. • Small capacity (but perfect for those who want a small cooler for the car). • Home outlet adapter sold separately. 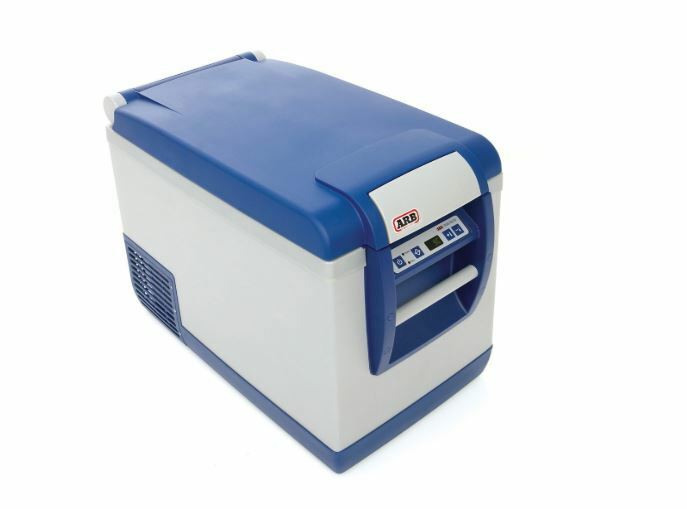 If you are an avid camper, outdoor adventure or road tripper, the ARB 50 quart fridge/freezer is one of the best portable coolers you can buy. This ARB unit is a proper fridge + freezer that uses a compressor like the one in your kitchen fridge. It can cool food and drinks down to a chill and even freeze them. With a capacity of 50 quarts, you are unlikely to run out of space for your drinks and snacks. This ARB fridge can fit up to 72 x 12 oz cans. You can even chill a full 2-liter bottle of soda. There is a general compartment for your drinks and a smaller one for dairy products and fruit. At 63 lbs, this is not exactly the most portable cooler. But it’s not meant to be carried by hand. You should place it in the bed of your track, the trunk of your SUV or in your RV. It’s also great for a boat. For easier use, I recommend you buy their fridge-freezer slide. You bolt the slide on the floor of your truck or RV and then install the fridge freezer on the slide. You can then pull it out like a drawer whenever you need to use it. This unit is quiet and very reliable on the road. It can work off of a 12V outlet in your car or RV or off a 120V outlet in your home (adapter included). When you are powering it with your vehicle, the ARB 50-qt fridge has a mechanism that allows it to continue drawing small amounts of power even with the vehicle off without depleting the battery. The only complaint is that it draws a bit too much voltage whenever the compressor kicks on. Your car battery or solar generator can drain down to a point where it’s unable to supply the required voltage to kick the compressor back on - after that, you are left with an insulated cooler. 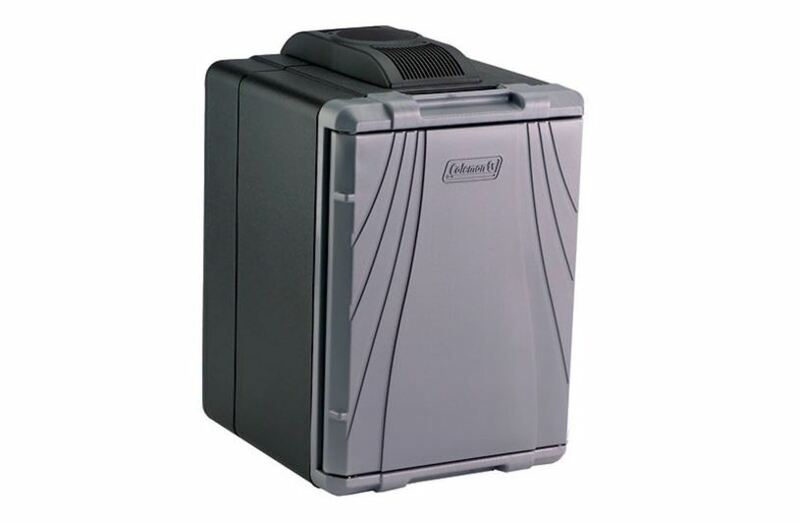 • Large capacity – one of the largest in portable electric coolers. 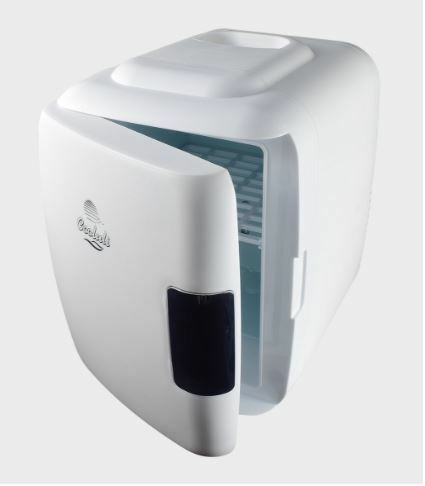 • Same powerful cooling and freezing capability as a kitchen fridge. • Includes adaptor for plugging into a 120V outlet. • Voltage surge when the compressor switches on. If you want a cooler for your boat or truck, something a larger than a compact car cooler will easily fit. But you also don’t want something too big that it clutters up the little space available. The 29-quart Koolatron Voyager cooler is perfect. It’s large enough to fit all the drinks and snacks you’ll need for your trips (holds up to 48 cans) but is still compact enough for your boat or truck. 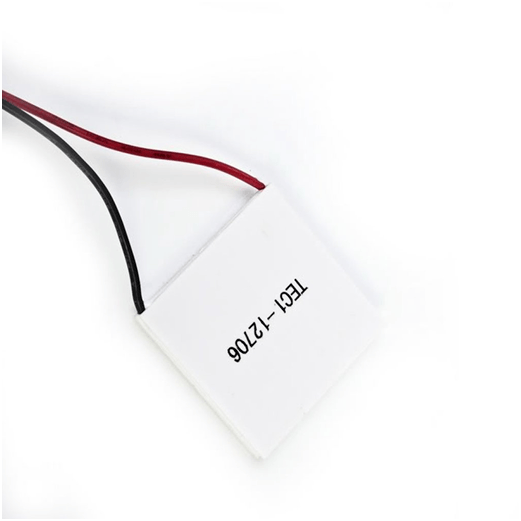 Because it is a thermoelectric cooler it is reliable and long-lasting. There is no compressor that can get damaged by vibrations from the road. The only moving part is the fan. It comes with a 12V plug for use in your vehicle or boat and offers both cooling and warming. For cooling, it can cool your drinks or food to 40F below the surrounding temperature. For warming it can heat to a temperature of 130F. You can use it upright like a fridge or put it down on its side depending on your situation. Either way, its solid build ensures it keeps going for years. • American-made – reliable and long lasting. • Large capacity yet compact. • Provides both warming and cooling. • Power cord tends to fall out especially when on the road – keep an eye on it. If you are looking for something cheaper but still big enough to hold all your drinks and snacks, I recommend this 25-quart thermoelectric cooler by Wagan. It has two modes – warm and cool – and you can select one simply by flipping a switch. There is an indicator to show you which mode is currently on. It can warm your food and drinks to around 140F and chill them to around 36F below the surrounding temperature. It connects to a 12V outlet with a 7.5-foot cord. If you want to use it at home or the office, you have to buy an AC adapter separately. While not the biggest electric cooler around, it’s big enough for your travelling needs. You can fill it with up to 27 cans. It has a lightweight design and a heavy-duty handle for easy portability. • The latch is a bit problematic, sometimes refusing to close properly. If you just need a small cooler for yourself or you and your road trip partner, the Cooluli Mini is a great choice. The Mini one of the smallest thermoelectric coolers at just 4 quarts (up to 6 x 12 oz cans) - so it is perfect for individuals or two people. This Cooluli has all the features of other high quality thermoelectric coolers – it can cool and warm (45F cooling below surrounding temperature, 122-144F warming), nice handle for portability, low power usage and silent operation. But the most unique feature, and my favorite one, is USB charging. That’s right, you can power this cooler from a power bank or solar generator. So if you are venturing far out into the wilderness away from your vehicle, you can still enjoy cold drinks whenever you want. And because the Cooluli Mini weighs just 5 lbs, carrying it by hand or in a bag won’t be an issue. • Highly portable – compact and lightweight. • Can be powered via 12V outlet or USB. 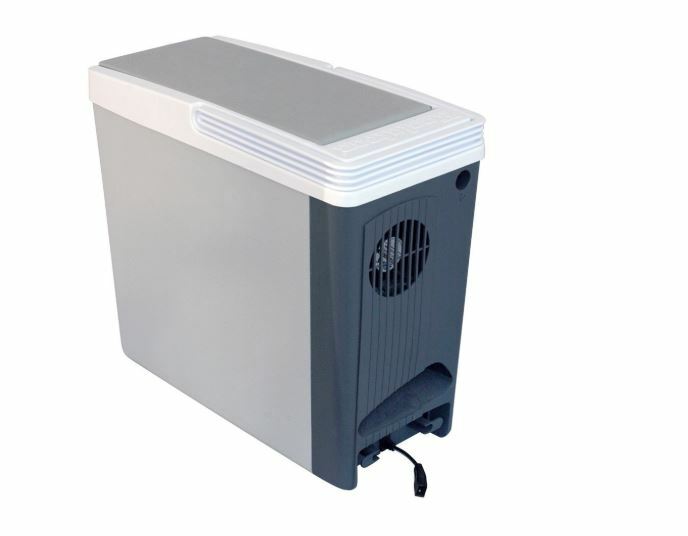 If you need more cooling power than a thermoelectric cooler can provide, the large Whynter FM-45G portable refrigerator is a great alternative. It has a large 45-quart capacity divided into two sections. You can use the entire unit as a refrigerator or use one section as a refrigerator and the other as a freezer simply by changing the temperature settings (-8F to 50F). It has a fast-freeze feature that quickly cools down the temperature to -8F. This is ideal if you’re fishing and need to freeze your catch immediately. 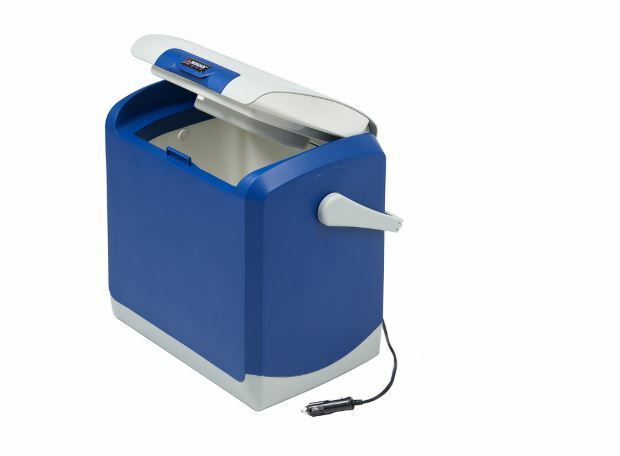 While larger than most portable freezers, this Whynter fridge is compact enough that you can place it on a counter or bench in your boat or RV. You can then power it using the 12V plug or the bonus AC cord. • Can be used as a refrigerator or freezer or both. • Chills better than a thermoelectric cooler. • A bit noisy when the compressor kicks in. If you are looking for a smaller thermoelectric 12V cooler for your car this one by Wagan is a great choice. This Wagan personal cooler/warmer provides 14 quarts of capacity (large enough for a small family) without taking up much space in your car. You can put it in the back seat or in the trunk. The 12V power cord is 9ft long. If you want to use it with your home power outlet you have to buy the AC adapter separately. One of the best features is the ability to both cool and warm your food and drinks. Just flip a switch to cool to 36F below surrounding temperature or to warm to 140F. There is an indicator at the back to show whether it is in cooling or warming mode. It also comes with 2 cup holders on the outside, making this cooler perfect for picnics, camping and other outdoor adventures. A nylon strap allows you to easily carry it from the car and back. • Compact and lightweight – great for travelling. Is It a Freezer, Fridge or Both? The best option will depend on your needs. If you need to preserve foods for long time, then definitely get a cooler with a freezer. If you just need to keep drinks cool, then a fridge-only model will do. 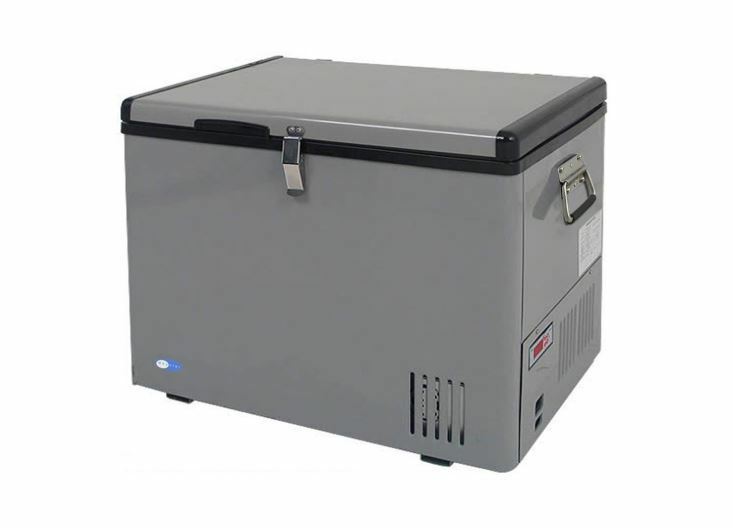 Note: if you buy a thermoelectric ice chest, it will be a fridge-only model. This is because these types of coolers cannot get cold enough to freeze. That said, you can often safely store frozen foods in a thermoelectric cooler for 2-3 days. If you get a compressor-run cooler, it will most likely have both freezer and fridge functions. By controlling the thermostat, you can decide to use it as a freezer, fridge or both (if it has two separate temperature-controlled compartments). Warming is a feature you’ll find in thermoelectric coolers only. These coolers work by transferring heat from one point to another. So as one area cools another warms up. Some coolers take advantage of this to offer dual cool and warm functions. Normally you can use it to keep your drinks cool. At the flip of a switch you can warm a quick dinner. Thermoelectric warmers don't get very hot, just warm enough to heat some leftovers, breast milk or some water. Most people rarely use the warming feature, but if you think it will come in handy on your trip find a thermoelectric cooler that has it. There are two types of electric coolers – those that use thermoelectric cooling and those that use compressors. 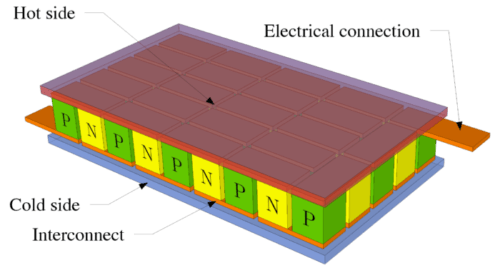 Thermoelectric coolers work through what is known as the Peltier Effect. It’s basically a way of transferring heat from one electric junction to another via an electrical current. As one area heats up the other cools down. All this is controlled by a very tiny device called a Peltier module. It’s really small, measuring around 1.5 by 1.5 inches. >> No moving parts. This increases the coolers reliability and longevity and reduces maintenance requirements. Many low cost thermoelectric coolers can easily last 4 or 5 years without a problem. >> Large capacity. Because there is no ice or a compressor to take up space, you are left with plenty of space to put your drinks and snacks. In other words they can offer more capacity without getting too bulky. >> Lightweight. Again, no ice packs or compressor. So the cooler feels very light which makes it great for travelling. One 40-quart thermoelectric cooler from our top picks above weighs just 18lbs while another 50-quart compressor-powered cooler weighs a whooping 63lbs. >> Dual function. Many thermoelectric coolers don’t just cool your drinks, they can warm them too. This is handy if you need some warm food when you are on the road. >> Cheaper than compressor-powered coolers. >> They are dependent on the environment. When mentioning a thermoelectric cooler’s capability, the manufacturer will say it can cool to 40 degrees Fahrenheit below surrounding temperature. So if you are in a very hot area your cooler won’t keep your drinks properly chilled. >> They cannot cool as well as compressor-driven coolers. This is why you won’t find a thermoelectric freezer. These are basically mini-fridges. These coolers use the exact same cooling mechanism used by your kitchen refrigerator. That means they can cool your drinks to a much lower temperature than a thermoelectric cooler and even freeze them. But you have to sacrifice on cost and portability. >> They cool drinks and food in any environment. >> Smaller capacity. The storage capacity tends to be smaller than a thermoelectric cooler of the same dimensions, because much of the internal space goes to the compressor mechanism. If you want a large-capacity compressor cooler, then you have to contend with extra weight and bulk. Don’t forget to check how cold or hot the cooler can get. A thermoelectric cooler can cool down to a maximum of 40F below the surrounding temperature. Those with a warming function can heat up to around 140F. For a compressor cooler, check how cold they can get. Most can go low enough to freeze whatever you’ve put inside. If you are buying a thermoelectric cooler, consider cooling capacity. This is how colder it can get compared to the ambient temperature. Cooling capacity ranges between 32F to 40F. This is another factor that depends a lot on your needs. For instance the number of people you are travelling with or the amount of food and drinks you need for the trip. If it’s just you, even a small 4-quart mini-fridge will do. 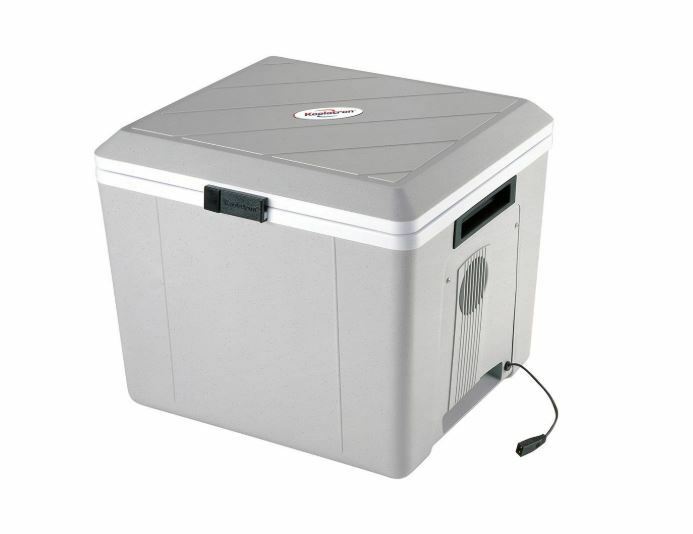 For families or on trips when you need to carry more stuff consider an 18-30 quart cooler. 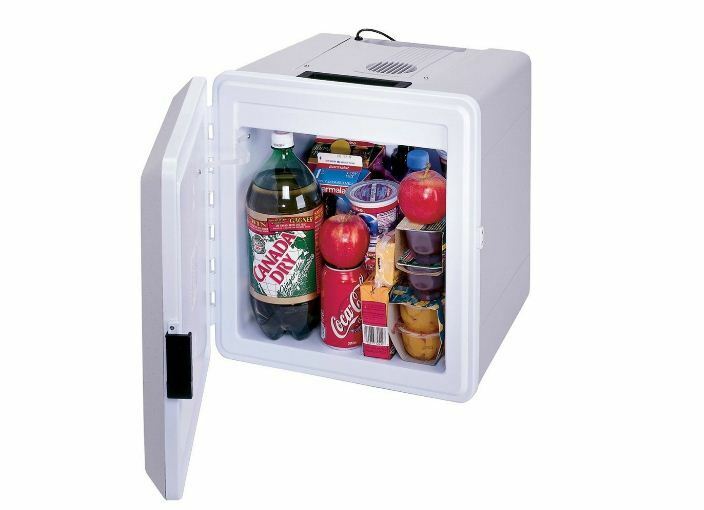 If you need to load up on a lot of foods or drinks, a 50-quart compressor-cooled cooler is great. But you’ll need to find a bigger place to place it in your truck, boat or RV. For the larger coolers check whether they come with organizational racks. These come in handy when you are arranging your food and drinks for the trip. Other advanced coolers even have a dedicated compartment for dairy and fruits. You are going to be lugging it around a lot so make sure the cooler is easy to carry. For small and mid-size coolers check that they have good quality handles. For larger units caster wheels will help you move it around. Will It Fit Between Seats? If you want a cooler you can easily access during a road trip make sure the one you buy is small enough to fit between seats or at least on a single seat. A compact cooler is especially handy if you don’t have a large trunk to put it in. Almost all portable electric coolers come with a 12V DC cord. You are supposed to plug it into the cigarette lighter in your car or RV. You can also hook it up to a solar generator if you are out camping. This is fine when you are on the road. But what do you do if you want to use it at home or somewhere where all the outlets are the standard 120V AC ones? Luckily, all coolers can also be powered by an AC outlet. But you need an adaptor. Here is where there is a difference between various coolers. Some manufacturers are kind enough to include the AC adapter along with the DC power cord. Others leave it out and you have to buy it separately if you want to use the cooler at home. But they are cheap. You can get a good quality on for around $15-$20. Not many electric coolers have battery backup. They only thing they do in the event of a power loss or disconnection is to try and keep your stuff cool for as long as possible. But if you do find one with battery backup check how long the battery can run in case you can’t find an outlet or want to take it outdoors away from any power source. How Heavy Is It When Fully Loaded? If you expect you are going to have to carry the cooler by hand a lot find one that is light. This way even when you fill it up with drinks and food it is not going to be very heavy. I recommend a thermoelectric cooler. Even the large-capacity ones don’t weigh a lot. But if the cooler is going to be sitting in your trunk or on a surface in your RV or boat most of the time then weight is not an issue. You can even get the 50-quart 63lb mini-fridge from our recommendations above. Can You Charge It Via USB? This is not a common feature yet, because most coolers are too large to charge via USB. But if you are going for a small cooler for just you or two people then definitely find one that comes with a USB charger. It will give you much more versatility. For instance, you can go camping or hiking with it and power it with your power bank or solar generator.